Born and raised in Baltimore, I have always felt a calling from the Lord to help neglected people. In the 7th grade I went on a missions trip to Washington D.C. where I worked with the homeless in soup kitchens and in street evangelism. For the past 15 years, God has blessed me with talents and gifts of being able to understand and have a heart for people that get overlooked by society. This ministry to me is not something I do because I feel guilty, or because I want to impress people. The reason I do what I do is because I am compelled by love. Not just the love I have for people, but the love that my Heavenly Father has so graciously lavished upon me. It is because of that love that I can do anything. It’s that love that motivates me to serve. There is no greater love. I was born and raised in Pittsburgh, PA. My entry into the world as the youngest of three children was among missionaries. My maternal grandmother and mother were both “home missionaries”. Home missionaries focus on urban ministry - feeding and caring for the homeless and reaching out to the less fortunate in communities throughout Pittsburgh. Having a “missionary spirit” is in my DNA. As a young adult I accepted my calling to the Gospel Ministry. After earning a Doctor of Ministry degree, from the Samuel DeWitt Proctor School of Theology, Virginia Union University, God sent me as a missionary to urban and rural communities in the U.S. and overseas. Because of my passion for people and ministry, my joy is working in urban communities. Two years ago I was asked to develop a community outreach ministry focusing on the needs of the homeless in partnership with The Salvation Army. It remains a thriving ministry with committed volunteers who desire to serve God and others. When my husband Ed and I decided to return to Pittsburgh, it was then I made the connection with and was called by God to serve L.I.V.I.N.G. 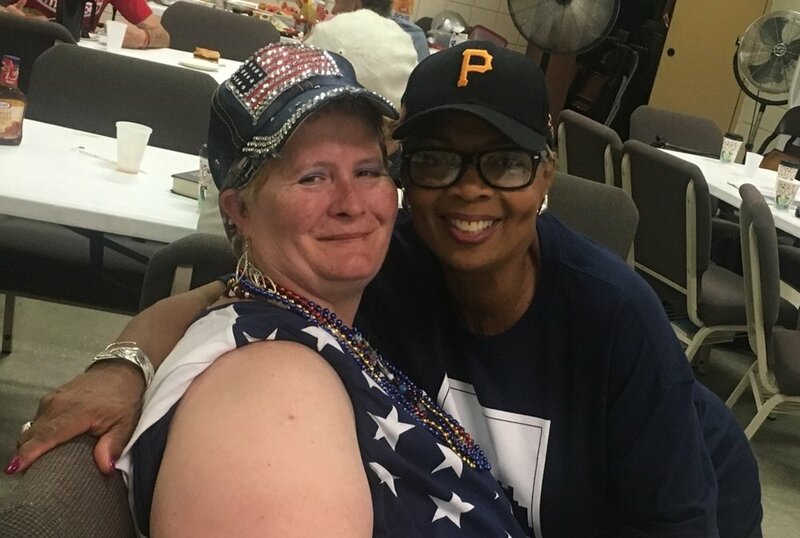 It is here where I hear Jesus say, “I came not to be served but to serve.” Serving the homeless women of Pittsburgh is where you will find me! I grew up in Jamestown, NY, the daughter of immigrant parents. When I came to Pittsburgh 15 years ago, I knew this was going to be my new home. Having gone through some life changes after moving here, God taught me many new things including how to lean on a new church family at Allegheny Center Alliance Church (ACAC). I was learning very quickly that the Lord had been preparing me for a specific role all along. That role would be to speak His truth while giving others hope. So how was I going to put this new role into action? Well, I met Charles at ACAC and was also learning about the way the ministry was supporting the homeless through countless others along the way. After much prayer, I took the risk of quitting a stable job in 2012 and began to pray for the job I was ordained to be in. If God wanted me to carry out his plan, I knew he would make a way. I started facilitating a women's bible study and volunteering for different opportunities at the church...LIVING Ministry was one of them. Today, I am so happy to be a part of a ministry that cares so deeply for the lost and homeless, whether it be feeling homeless inside their hearts or they are truly without a home. Thank you Lord for changing my life and giving me the honor of serving you in this capacity! I have felt God’s call into ministry since I was in 7th grade, while I was participating in a missions trip serving those experiencing homelessness in Philadelphia. Ever since, I have been on the journey of trying to figure out where He wanted me. The summer of 2016, after my freshman year at the University of Pittsburgh, I served alongside a ministry on the Pine Ridge Indian Reservation in South Dakota. Leaving the Lakota Sioux people at the end of the summer was an incredibly difficult task, as I felt God was calling me there to serve. However, I knew in my heart that our amazing Lord placed me at Pitt for a reason, and as I headed back to school I looked for opportunities to further serving Him. In the Fall of 2016 I connected with LIVING Ministry as a volunteer, and in the Winter I started working here part-time. I am so grateful for the opportunity to continue to serve and be served by the people our gracious God puts in my life, and I am so excited to see where He leads me. I grew up in a small town north of Pittsburgh, in a loving Christian home. I feel like I have been a Christian for most of my life, but my faith became real when I was a young adult. I studied Spanish in college and traveled to several Spanish speaking countries with the hopes of being an overseas missionary someday. As with most of my ideas, God had better plans! I married my amazing husband and within 6 years, we had 3 great children. Fast forward a decade, and our family is now in the full time ministry of fostering children. This has been the most challenging, stretching and rewarding season of our lives. God is very close to the vulnerable and by coming alongside them, we can witness His goodness in new ways. Our family has also enjoyed serving with LIVING ministry over the years and now coming on staff seems very natural. I hope to continue to learn and grow as I am a small part of God’s hands and feet to His precious ones here in Pittsburgh. My dream of being a missionary has come full circle in so many ways- none of which I ever imagined!